Kolkata, April 11: Printing press owners, for whom elections used to bring a big bonanza, are ruing the stagnation in the number of orders from political parties as candidates are increasingly turning to social media for canvassing. "Earlier, the poll season always provided good business for printing presses and machines worked round-the-clock to meet the demand. The scenario has changed drastically in national election with the advent of social media campaigns, which are cost effective," All India Federation of Master Printers' Vice President (West) Vilas Sangurdekar told IANS. He said restrictions imposed by municipal corporations in many cities on displaying banners, posters, flex and other materials in public places has also put a brake on demand for such campaign material. Echoing him, Ludhiana-based Offset Printers' Association President Parveen Aggarwal told IANS: "Growing preferences for social media campaign among candidates of all parties has so far dimmed the hopes of many printers of raking in the moolah to a large extent. There is hardly any business this time around." Press owners, however, said a handful of printing presses are bagging election business but volumes of orders had not picked up ahead of the first phase of polls that began on Thursday. This is, maybe, because "national parties took time to announce the names of their candidates and the nominees got less time (to canvass)". Lok Sabha Elections 2019: 63,449 Poll-Related Posters Removed in Delhi, 181 FIR Registered, Says CEO. Compared to national elections, the printing business, according to them, gets a surge during local and assembly polls as parties and more candidates turn to them for promotional activities. "For example, there are 48 parliamentary constituencies in Maharashtra and about 150 odd candidates are in fray, which is much less in number compared to local and assembly elections. Bulk orders are usually placed from the respective party's central offices. Maybe, some with big capacity are getting orders but election business is largely dull this time," Sangurdekar said. Unlike earlier polls seasons, many printers across cities now are not even keen on pitching for election orders because of increasing compliance instructions decreed by the Election Commission. They also said a cautious spending approach opted by the candidates amid a stringent expenditure monitoring exercise by the Commission has led to shrinking margins for them. "With increasing restrictions and compliance instructions from by the Election Commission, it becomes difficult for any printing entity to reap benefits in terms of extra revenue from printing of various election material. We are even required to submit the details of the printing orders, which are cumbersome," Aggarwal argued. 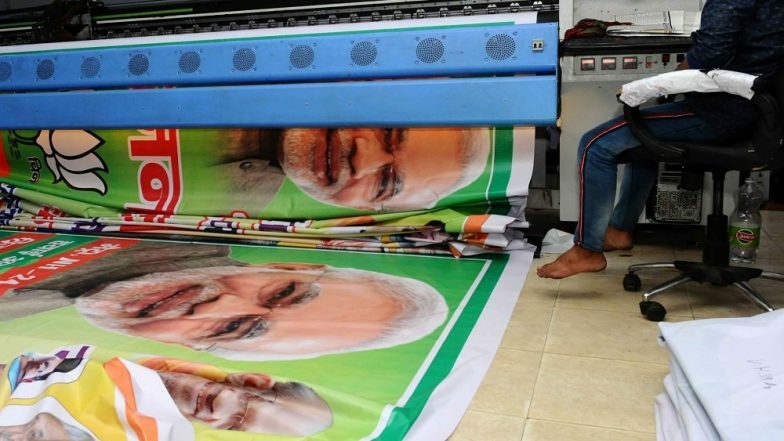 West Bengal Master Printers' President Sandip Kumar Sanyal told IANS: "Compared to the 2014 elections, business for printing election material has been dented by aggressive social media campaign. Moreover units facing dearth of working capital in the aftermath of demonetisation and GST are not keen because they get payments late for election business." "Increasing compliance costs for poll-related orders and surging input costs have reduced printers' margin to not even five per cent while candidates have become mindful about spending in view of stringent expenditure monitoring." Following an Election Commission directive that all political parties, contesting candidates and their authorised agents desist from utilising environmentally hazardous material, printers witnessed a lack of demand for flex and other toxic campaign material while orders for printed canvass and headbands, customised garments and T-shirts with the parties' emblem are gaining traction so that voters can be wooed in the world's largest democracy.